Tort liability and the prohibitive costs of malpractice insurance for OB-GYNs are often cited as drivers of rising rates of cesarean section utilization, with tort reform touted as the only thing that will really lower cesarean rates in the U.S. In a May 21, 2012 interview, Dr. Ronald Stewart applauded the Texas’ 2003 Proposition 12, which resulted in a 19% increase per 100,000 population of practicing physicians. “Tort reform has been beneficial for all or almost all Texas physicians,” Dr. Stewart said in an interview in advance of the meeting. “I have benefited from lower malpractice premiums and a more favorable liability climate in the state. However, the effect of tort reform in a region is probably not the primary driver for physician recruitment and retention. I believe it is permissive – providing the framework for growing physicians relative to the number of patients being served,” he explained. Public Citizen’s new report, Medical Malpractice Payments Sunk to Record Low in 2011, doesn’t refute the claim that tort reform in Texas resulted in an increase the number of working physicians in Texas, but argues that Proposition 12 did not lower healthcare costs or produce better care as proponents of the measure claimed it would. Between 2000 and 2011, the value of medical malpractice payments fell 11.9 percent while healthcare spending nearly doubled, increasing 96.7 percent (both calculations in unadjusted dollars). These figures debunk claims that medical malpractice litigation is responsible for rising healthcare costs, as well as promises that patients should expect savings from litigation restrictions. Actual results in Texas disprove the claims put forth by Smith and other national political figures. Malpractice payments on behalf of Texas doctors declined nearly 65 percent (in unadjusted dollars) from 2003 to 2010, Public Citizen found in an analysis of outcomes in Texas that was published in 2011. But private insurance rates and per-patient Medicare spending in Texas have increased faster than the national average. The report also supports what citizen advocacy organization Texas Watch wrote in 2011 in the Defending Ourselves against Defensive Medicine series on The Unnecesarean. Texas voters were given a false choice in 2003: lose their doctors or lose access to their courts. As Texans were going to the polls to vote on an amendment to the state constitution known as Proposition 12, which placed severe and arbitrary restrictions that make it nearly impossible for those devastated by medical negligence to seek justice through our courts, they were inundated by an insurance industry-funded onslaught of slick advertising designed to scare them into thinking that their health care system would collapse if they didn’t give up their constitutional right to seek justice in our courts. Caps on noneconomic damages were the leading predictor of delivery method among the 10 types of tort reforms investigated. 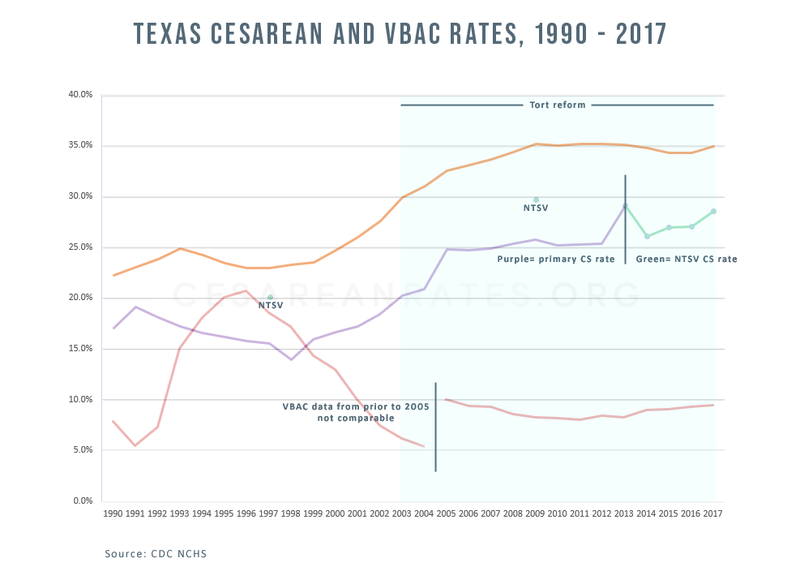 VBAC rates were significantly higher and cesarean section rates were significantly lower in state-years in which caps on noneconomic damages were in force. The effect size increased with the stringency of the cap: caps of $250,000 or less were associated with a 1.92 percentage point (7.97%) higher VBAC rate, caps between $250,001 and $500,000 with a 1.37 percentage point (5.69%) higher rate, and caps above $500,000 with a 1.25 percentage point (5.19%) higher rate. Noneconomic damages caps were inversely related to rates of cesarean section, although the effects were smaller and were statistically significant for only the lower cap levels. A cap of $250,000 or less was associated with a reduction of 0.48 percentage points (3.68%) in the primary cesarean section rate and a 0.32 percentage point (1.5%) reduction in the total cesarean section rate. Extrapolating to the national level, our estimates suggest that a nationwide cap on noneconomic damages at the $250,000 level would be associated with approximately 9000 more VBACs, 12,800 fewer cesarean sections, and 8000 fewer primary cesareans per year. According to this study, a nationwide cap on noneconomic damages at the $250,000 might result in an approximately 1% drop in the cesarean rate. 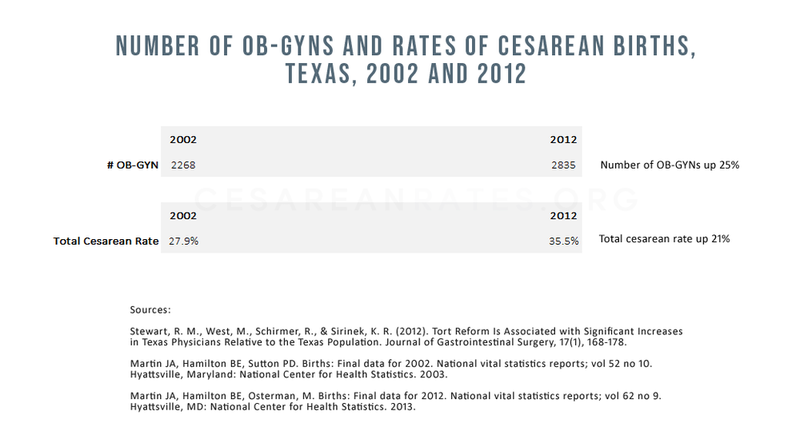 In theory, Texas might have seen a slight drop in its cesarean rate since 2003 as a result of tort reform. Did tort reform have the effect on the cesarean rate that physicians hoped it would? While tort reform in Texas did not decrease the cesarean rate, it did significantly increase the number of physicians in Texas relative to the population as previously stated. The post-tort reform period in Texas was associated with a significantly increased growth rate of physicians relative to the Texas population. Tort reform, as implemented in Texas, provides a needed framework for improving access to health care. Another look at Texas obstetric utilization numbers from the enactment of tort reform to present day. Tort Reform Didn’t Produce a Concomitant Drop in Cesarean Rates. What Intervention Does Work? Real or perceived liability fears are a frequently cited barrier to implementation of cesarean quality improvement work. To date, what has resulted in a safe, rapid reduction in the cesarean rate is a multi-dimensional quality improvement approach. Arkansas demonstrated ongoing success in lowering the NTSV cesarean birth rate in the Medicaid population via the Arkansas Medicaid’s Inpatient Quality Incentive program. Shifting the focus from defensive medicine to quality and safety is better for providers, hospitals and patients, according to the CMQCC Support Vaginal Birth toolkit (p 67). A real impact can be made on the 75% of claims filed for serious negligent behavior by focusing on care improvement strategies for providers and the systems that deliver care. Quality improvement efforts have the potential to significantly decrease overall litigation, premium costs, and payouts. Several organizations offer free quality improvement solutions online, including condition-specific toolkits and larger scale data collection and analysis protocols.